Mobile advertising and ad optimization company Smaato is releasing a new whitepaper today with some huge projections for the mobile advertising industry. According to Smaato, the US is the second largest mobile advertising market globally in terms of spending, falling just behind Japan. 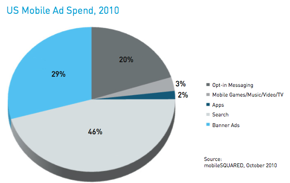 In 2010, Smaato says US mobile advertising spending is expected to be worth $797.6 million. For the US, this equates to a little under 8,000 mobile advertising campaigns, and an average of 21.8 new campaigns per day. Smatto says that the U.S. mobile ad market will move closer to Japan (more than $1 billion in 2010) next year with a forecast of $1.24 billion for 2011 and $5.04 billion for 2015. eMarketer released similar findings a few weeks ago, but Smaato’s finding are more bullish on projections for 2015. Here’s the reasoning. The company says that US has over 300 million active mobile subscriptions, of which, almost one-third use their mobile phone to browse. This number is only expected to grow in the next few years. Because of the high number of mobile users, the average mobile advertising campaign spend is between $75,000 – 100,000, which is much higher than in other countries. 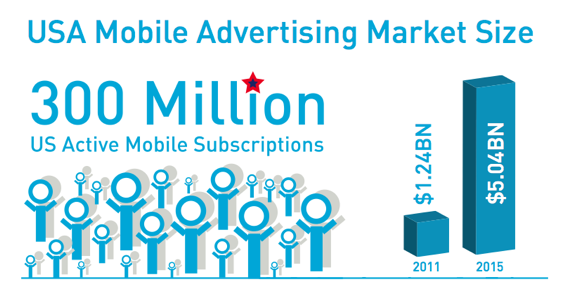 And the report contends that the mobile advertising market is is still young and has not fully matured. Smaato says that mobile has yet to penetrate over 50% of the US mobile population in terms of advertising. As smartphone usage increases, interact rates will increase and advertisers will be more willing to shell out ad dollars. While it’s still difficult to know just how huge mobile advertising will become, we do know that the market seems to be growing at a fast rate as technology giants like Apple and Google throw their hats in the ring via acquisitions. Steady increases in the use of smartphones, new innovations in mobile ad formats and other factors are all contributing to market that is growing like gangbusters.